Home of the famous Californian Disneyland Resort, Anaheim comes with a huge choice of hotels, to cope with the annual influx of summer tourists. 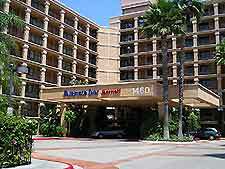 Accommodation is in good supply all around Anaheim, with many hotels being well-placed for access to the plentiful attractions at Disneyland, which stand on the southerly side of the city. 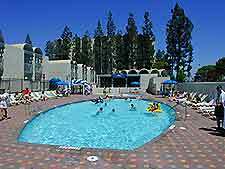 The lodging scene in this city is also greatly affected by events being staged at the Anaheim Convention Center, which lies on the southern outskirts of Disneyland and off West Katella Avenue, where it is the biggest convention center on the whole of the West Coast. Nearby accommodation is based along West Convention Way, where both the Clarion and the Hilton hotels are particularly close by. If you are looking for budget accommodation in Anaheim, then you will find a good choice of two-star hotels and motels located along West Ball Road, being approximately 1 mile / 1.5 km from the Disneyland Resort. Also worth considering on West Ball Road is both the Americas Best Inn and the Travelodge, while also very close by are the cheap hotels along West Katella Avenue, which include the likes of the Jolly Roger Inn and the Quality Inn and Suites. The budget two-star lodging along South Harbor Boulevard is also near to the Disneyland Resort and includes the Anaheim Del Sol Inn, the Comfort Inn Maingate, the Days Inn, the Hacienda Inn and Suites, the Plaza Hotel, the Quality Inn Maingate and the Rodeway Inn. In many cases, the mid-range accommodation in Anaheim is simply interspersed with the budget hotels, all of which are vying for the best spot. 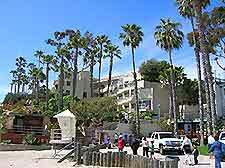 On Convention Way and a mere block from Disneyland are the very popular Clarion and Hilton hotels. The South Harbor Boulevard is another favourite haunt with holiday makers looking for three-star hotels, being home to the Best Western Park Place, the Fairfield Inn by Marriott, the Howard Johnson and the Sheraton Park. 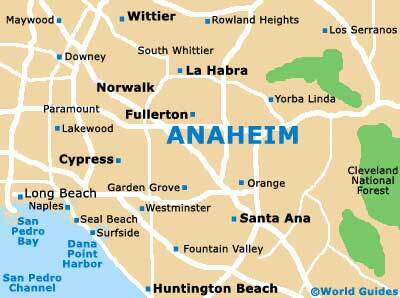 Luxury hotels in Anaheim are generally concentrated around South Disneyland Drive and West Orangewood Avenue. Particularly special is Disney's Grand Californian Hotel and Spa, which is based within the Downtown Disney District itself and offers four-star accommodation and rooms with views of the surrounding Disneyland Resort, the swimming pool and its redwood slide, and the Anaheim cityscape. Close to the city of Anaheim are the neighboring Californian towns and cities of Fullerton, Garden Grove, Orange, Placentia and Stanton, each of which comes with a selection of very affordable accommodation, suiting those prepared for a short commute.